Classical presentations of splenic injury are hemodynamic instability, severe abdominal pain, and symptoms of peritonitis. Nevertheless, lack of mentioned signs and symptoms cannot rule out splenic injury. In order of minimizing mortality and morbidity of abdominal blunt trauma, a complete physical examination and rapid imaging such as ultrasonography and computed tomography scan (CT scan) to evaluate intra-abdominal visceral injury are necessary. The accuracy of physical examination in abdominal visceral injury anticipation has been assessed as follows; sensitivity and specificity of traumatic-induced abdominal tenderness are 82% and 45%, respectively. In addition, 40% of patients would present no clinical symptom in early stages. Today, numerous splenic injury grading systems based on CT scan findings have been recommended. These systems have been suggested in order of radiological reports standardization, appropriate therapeutic schedule establishment, and comparing different studies. Nevertheless, none of the grading systems has been presented as an appropriate predictor one for surgical necessity. The most common grading system used in traumatic patients is the American Association for the Surgery of Trauma (AAST) that has some limitations in surgical necessity prediction. Even with revised AAST, vascular injury and active bleeding have not been considered. Currently, a new grading system (the new system) has been recommended. In the new method, better estimation of splenic injury grade and necessity of surgery have been presented. In this system, some aspects such as contrast extravasation, pseudoaneurysm, arteriovenous fistula, and severity of hemoperitoneum have been evaluated as well. In fact, this new system has provided further evaluations that were underestimated in AAST, but questions about cutoff point for consideration of surgical management of blunt splenic injury have not been responded yet. Although there are some studies in which the new grading system has been assessed, the number of studies that have determined a cutoff for making decision for operative or nonoperative management of splenic injury is rare. Based on what was mentioned above and due to limited number of studies about comparison of different traumatic grading systems, the aim of this study is to compare and prioritize AAST grading system with the new recommended one. 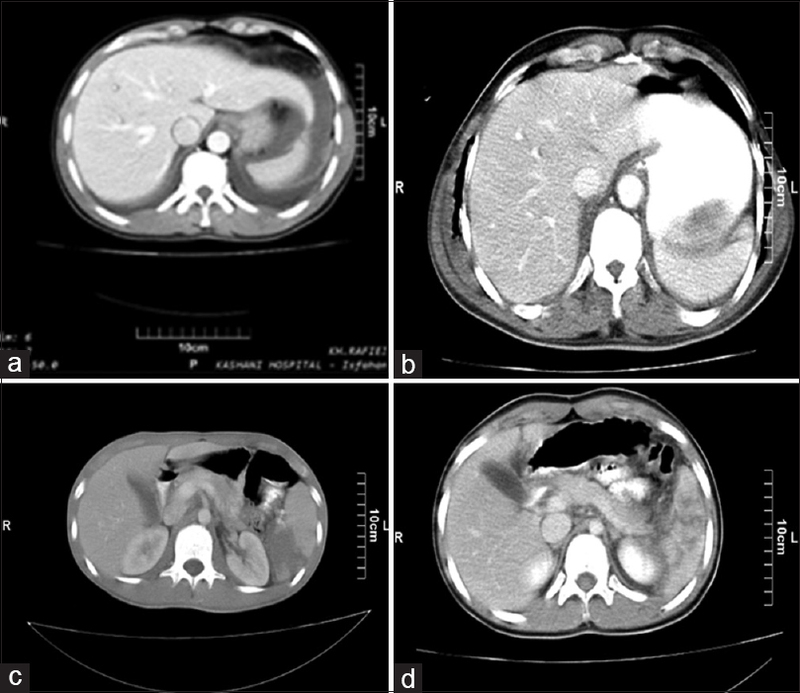 This is a cross-sectional study on patients with abdominal trauma who underwent abdominopelvic CT scan with trauma protocol, and splenic injury was confirmed for them. The studied population was those traumatic patients referred to Al-Zahra and Kashani Hospitals (affiliated to Isfahan University of Medical Sciences, Isfahan, Iran) in 2013–2016. Inclusion criteria were as follows: (1) splenic injury, (2) having abdominal CT scan with intravenous (IV) contrast, and (3) therapeutic protocol completion. Exclusion criteria were as follows: (1) low-quality CT-scan that was hard to be interpreted, (2) patients' death before surgical intervention, and (3) iatrogenic splenic injury. Consent forms for participating and all needed information about the study were given to patients. This study was approved by the Research Council and Ethics Committee of School of Medicine of Isfahan University of Medical Sciences (No: 395547). All patients underwent abdominopelvic CT scan with IV contrast, but with/without oral contrast, according to patient's situation (spiral or multi-detector imaging). In this term, 30 min before imaging, water-diluted meglumine compound was given orally (40 cc meglumine compound 76% was added to 1000–1400 cc water). Oral solution was given to patients to use per oral or through nasogastric tube; then, a water-soluble contrast agent was injected to all patients (1 cc/kg in adults and 2 cc/kg in children) IV using 16–20-gauge cannula and through a pump during CT scanning. Images were provided in portal phase (60–70 s after IV contrast injection initiation). CT scan sections were taken from the upper part of diaphragm to inferior margin of pubic symphysis with CT scan device multi-detector CT (MDCT) 64 GE NCT, 2006, thickness = 0.625 mm, mA = automatic exposure control, kv = 120 v, collimation = 40 mm, rotation time = 0.5 s, pitch = 1 in Al-Zahra Hospital and Shimadzu Spiral TE 7800 made in 2004, thickness = 10 mm, mA = 100, kv = 120 v, collimation = 10 mm, rotation time = 1.5 s, pitch = 1 in Kashani Hospital. The images of CT scans were reviewed by a radiologist who was blind about the splenic injury treatment program, to grade their splenic laceration according to two different scoring systems. The data of treatment decision and final treatment were collected from the patient medical records. The clinical decision made for patients was compared by recommendation according to the AAST and the new splenic laceration scoring system [Table 1] and [Table 2]. 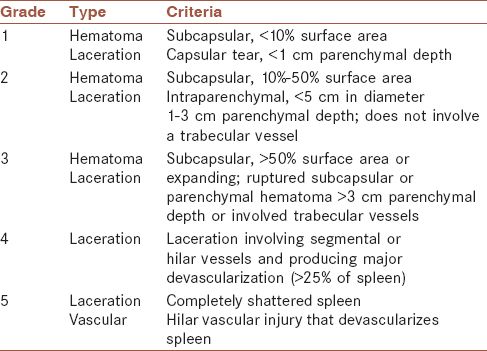 [Figure 1] demonstrates the two splenic injury grading systems differentiations. In the current study, active bleeding is considered as a linear or irregular region of contrast enhancement similar to the aorta or adjacent large vessels attenuation. Furthermore, pseudoaneurysm and fistula were defined as areas with distinct margins of contrast enhancement with adjacent large vessels attenuation. Descriptive data are reported as mean ± standard deviation. For analytics, Pearson's or Spearman's correlation coefficient, independent t-test, and exploratory and confirmatory factor analysis were used. Data were analyzed using IBM SPSS Software version 20 (SPSS, Inc., Chicago, IL, USA). P < 0.05 was considered statistically significant. This study was a cross-sectional study on 68 patients with blunt abdominal trauma, who had the diagnosis of acute splenic injury on their hospital medical records. During these years, 18 patients with the mentioned inclusion criteria were referred to Al-Zahra Hospital and 50 patients were referred to Kashani Hospital, main referral center of trauma in Isfahan, Center of Iran. [Table 3] compares sensitivity, specificity, negative predictive value, and positive predictive value of different cutoffs in two systems. AAST Grade 2 has been compared with the new system Grade 2. This comparison showed no significant difference (P = 0.816). Comparison of Grade 3 of two systems and Grade 4 of AAST with Grade 4a of the new system showed no significant difference (P = 0.972 and 0.852, respectively). Receiver operating characteristic (ROC) curve of two systems in terms of different grading is shown in [Figure 2] (P = 0.706). Based on the findings of [Figure 1], cutoff of Grade 2 had 90.3% of specificity and 51.4% of sensitivity in AAST system while it was 90.3% and 45.9% of specificity and sensitivity for the new system, respectively. Based on this figure, the area under AAST curve is 0.784 (95% confidence interval [CI]: 0.675–0.892) and area under the new recommended system is 0.747 (95% CI: 0.631–0.863). ROC curve of two systems in terms of different grading in Kashani Hospital is shown in [Figure 3]. According to data of [Figure 2], in case of considering grading score of 2 as the cutoff for surgical treatment based on AAST grading system, specificity of 95% and sensitivity of 51% have been presented while this cutoff for the new system accounts for specificity of 90% and sensitivity of 41%. Based on this figure, the area under AAST curve is 0.817 (95% CI: 0.702–0.932) and area under the new recommended system is 0.730 (95% CI: 0.591–0.869). 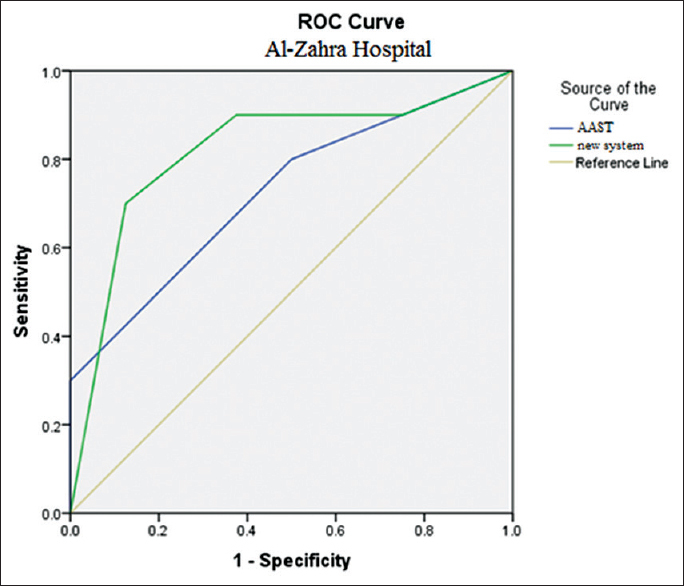 ROC curve of two systems in terms of different grading in Al-Zahra Hospital is shown in [Figure 4]. Due to data of [Figure 3], in case of considering grading score of 2 as cutoff for surgical treatment based on AAST grading system, specificity of 80% and sensitivity of 50% have been found while this cutoff for the new system accounts for specificity of 90% and sensitivity of 63%. Based on this figure, the area under AAST curve is 0.725 (95% CI: 0.489–0.961) and area under the new recommended system is 0.819 (95% CI: 0.606–1.000). Spleen is the most prevalent viscera that may be injured through blunt trauma. Formerly, surgical methods played an important role in the management of splenic injury, but through the time, the importance of spleen salvage was proved increasingly; thus, nonoperative management drew on the comments toward itself. Recently, up to 90% of splenic injuries have been managed nonsurgically and even up to 80% of high-grade injuries are being managed through embolotherapy. Nonoperative or operative management of splenic injury due to blunt trauma has always been a dilemma for surgeons. 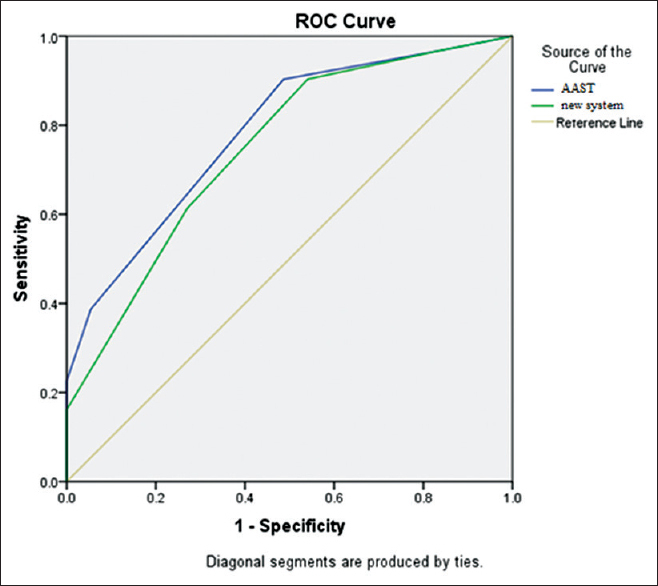 In the current study, a new system for reporting CT scan of the spleen and predicting the need for surgery has been compared with previous widely utilized grading system of AAST grading system. AAST grading system is a grading system for splenic injury assessment raised since 1987 in order of facilitating management and evaluating outcomes of splenic injury due to blunt trauma. Using CT scanning led to lower need of operative management in low-grade injuries. This trend of imaging was accompanied with the AAST revision in 1994. Although providing MDCT increased ability of imaging in more accurate demonstration of splenic injury, it has been reported that imaging is not predictive enough for nonoperative management. Observatory management of splenic injury based on AAST may be accompanied by inappropriate outcomes as numerous mismanaged cases have been reported with vascular lesions that underwent nonoperative observation based on AAST. Vascular injuries including arteriovenous fistula, active bleeding, and pseudoaneurysm have been presented as warning signs of nonoperative management failure. Using MDCT provides better vision of injury grade, thus higher success rate. Considering what was mentioned above, AAST cannot be considered as mere guidance for the management of splenic injury due to blunt trauma. The new grading system findings are based on CT scanning, and in contrast to AAST, active bleeding and vascular injuries have been considered in this grading system. In this grading, vascular injury with or without active bleeding is defined as Grade 4. In this term, patients with spleen vascular injury should undergo angiography. Thus, nonconservative method of management should be considered. In the current study, we found that using cutoff of 2 had specificity of 90.3% and sensitivity of 51.4% for AAST method of grading. These sensitivity and specificity with similar cutoff were 90.3% and 45.9% for the new system, respectively. Due to the findings of this study, the new recommended system was not significantly different from AAST grading system in order of spleen blunt trauma injuries when we consider the results of all assessed population. Considering the results of Al-Zahra Hospital, by MDCT scan administration, the new grading system is superior because active leaks and vascular injury can be confirmed more correctly using MDCT scan. On the other hand, use of spiral CT scan showed no superiority of the new grading system because of its weakness in diagnosis of vascular injury and active bleeding. Marmery et al. had compared AAST with similar new system as we have done. In mentioned study, they have reported superiority of the new grading system in comparison to AAST regarding anticipation of operative or nonoperative splenic injury management caused by blunt trauma. In addition, they presented superiority of arteriography alone compared with laparotomy. In addition, Saksobhavivat et al. assessed diverse grading systems and presented the new grading system as the best sole indicator of operative or nonoperative management of splenic injury. They mentioned that the new grading system was better in any aspects of splenic injury significantly, except in terms of abbreviated injury score. 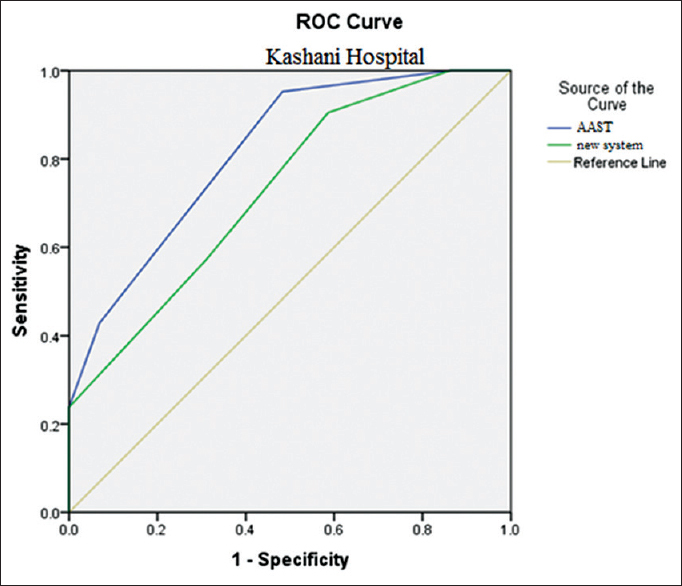 Based on the findings of this study, comparison of Al-Zahra Hospital (MDCT scan) and Kashani Hospital (spiral CT scan) in terms of using cutoff of Grade 2 for making decision about surgical or nonsurgical management of splenic injury shows higher sensitivity and specificity in Kashani Hospital for AAST method, while in the new recommended method, sensitivities were similar and Al-Zahra Hospital had a little higher specificity. These differences can be attributed to larger population of studied patients of Kashani Hospital or to different types of CT scan devices of two centers as discussed previously. In addition to these factors, type of surgeons in our two hospitals is different because the Al-Zahra Hospital is an educational center managed by faculty member surgeons, but the Kashani Hospital is managed by general surgeons working there directly. Based on the findings of this study, cutoff Grade of 2 had specificity of 90.3% and sensitivity of 45.9% for the new recommended study that was not significantly different from AAST with 90.3% specificity and 51.3% sensitivity. Therefore, this new grading method in contrast to the previous studies was neither superior nor inferior to AAST. Further studies with larger populations are recommended. However, considering cases studied by MDCT scan, in terms of active bleeding diagnosis, there is obvious superiority of the new scoring system in comparison to AAST scoring. The authors would like to gratefully acknowledge the patients participating this project. The current paper was conducted with the support of Research Deputy of Isfahan Medical School. Kailidou E, Pikoulis E, Katsiva V, Karavokyros IG, Athanassopoulou A, Papakostantinou I, et al. Contrast-enhanced spiral CT evaluation of blunt abdominal Trauma. JBR BTR 2005;88:61-5. Terry BM, Maydell A, Andronikou S. FAST as a predictor of clinical outcome in blunt abdominal trauma. SA J Radiol 2011;15:108-15. Poletti PA, Mirvis SE, Shanmuganathan K, Takada T, Killeen KL, Perlmutter D, et al. Blunt abdominal trauma patients: Can organ injury be excluded without performing computed tomography? J Trauma Acute Care Surg 2004;57:1072-81. Sikka R. Unsuspected internal organ traumatic injuries. Emerg Med Clin North Am 2004;22:1067-80. Ferrera PC, Verdile VP, Bartfield JM, Snyder HS, Salluzzo RF. Injuries distracting from intraabdominal injuries after blunt trauma. Am J Emerg Med 1998;16:145-9. Moore EE, Cogbill TH, Jurkovich GJ, Shackford SR, Malangoni MA, Champion HR, et al. Organ injury scaling: Spleen and liver (1994 revision). J Trauma Acute Care Surg 1995;38:323-4. Olthof DC, van der Vlies CH, Joosse P, van Delden OM, Jurkovich GJ, Goslings JC, et al. Consensus strategies for the nonoperative management of patients with blunt splenic injury: A Delphi study. J Trauma Acute Care Surg 2013;74:1567-74. Hassan R, Abd Aziz A, Md Ralib AR, Saat A. Computed tomography of blunt spleen injury: A pictorial review. Malays J Med Sci 2011;18:60-7. Anderson SW, Varghese JC, Lucey BC, Burke PA, Hirsch EF, Soto JA, et al. Blunt splenic trauma: Delayed-phase CT for differentiation of active hemorrhage from contained vascular injury in patients. Radiology 2007;243:88-95. Marmery H, Shanmuganathan K, Alexander MT, Mirvis SE. Optimization of selection for nonoperative management of blunt splenic injury: Comparison of MDCT grading systems. AJR Am J Roentgenol 2007;189:1421-7. Zarzaur BL, Kozar RA, Fabian TC, Coimbra R. A survey of American Association for the Surgery of Trauma member practices in the management of blunt splenic injury. 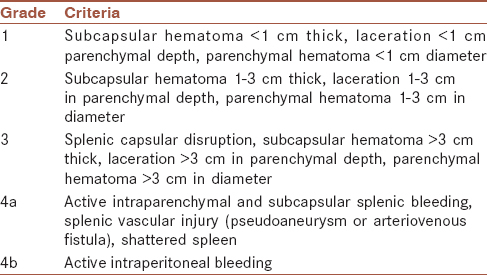 J Trauma Acute Care Surg 2011;70:1026-31. Boscak A, Shanmuganathan K. Splenic trauma: What is new? Radiol Clin North Am 2012;50:105-22. Renzulli P, Gross T, Schnüriger B, Schoepfer AM, Inderbitzin D, Exadaktylos AK, et al. Management of blunt injuries to the spleen. Br J Surg 2010;97:1696-703. Moore EE, Shackford SR, Pachter HL, McAninch JW, Browner BD, Champion HR, et al. Organ injury scaling: Spleen, liver, and kidney. J Trauma Acute Care Surg 1989;29:1664-6. Shanmuganathan K, Mirvis SE, Boyd-Kranis R, Takada T, Scalea TM. Nonsurgical management of blunt splenic injury: Use of CT criteria to select patients for splenic arteriography and potential endovascular therapy. Radiology 2000;217:75-82. Saksobhavivat N, Shanmuganathan K, Chen HH, DuBose JJ, Richard H, Khan MA, et al. Blunt splenic injury: Use of a multidetector CT-based splenic injury grading system and clinical parameters for triage of patients at admission. Radiology 2015;274:702-11.